Customers want friendliness. They want to be greeted by a smiling voice and a “Hey, how are you today?” They want empathy, as well. They want to hear you say that if you were in a similar situation, you would feel the same way. A fair resolution to their problem is what all customers are looking for. A customer might ask you for a full refund and a replacement product as a solution and that would certainly make the customer happy but it doesn’t serve your business’s bottom line. Declining to provide any type of accommodation would certainly protect your profit margins but would probably result in a very unhappy customer. Meeting somewhere in the middle will almost always satisfy the caller. Following tried and true customer service rules is the way to do it. Customers appreciate it when they feel that you are participating in the resolution of the problem. Assuring them they you have the solution and explaining the steps you will take, along with the steps that they should take, will engage the customer to participate in a good outcome. If their problem cannot be fixed, customers need alternatives. Tell them what you can do, not what you can’t. Above all, customers want information, not excuses. They called to find out why they experienced a problem and what needs to be done in order to fix it. Excuses are usually offered with the hope that the customer will understand and calm down, but excuses are not helpful. The customer didn’t call to find out who is to blame for their problem, they called to find a solution. Don’t offer excuses, offer help. 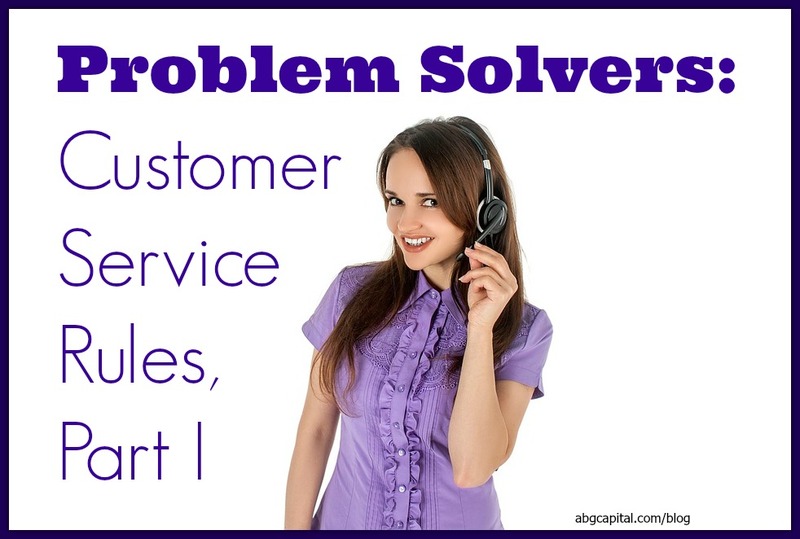 Assure the customer in positive terms that you can and will help solve their problem. Remaining in a positive frame of mind is so important when speaking to customers over the phone. You have to work harder because they can’t see your facial expression and you can’t see theirs. You have to listen to their voice and the information they’re giving you. A trick you’ve probably heard, but bears repeating, is that you should smile because customers can hear it in your voice! The first thing you should do when you are faced with a caller that has a problem is apologize. The customer’s feelings are critical and a sincere apology for the fact that the customer has a problem with your company will go a long way, then, offer sympathy. Why sympathize when you’ve just apologized? Aren’t they almost the same? It is true that they are similar, but there is a very important difference. Apologizing says that you regret the problem occurred. Sympathizing tells the customer that you understand their feelings about it. Put yourself in the customer’s place. How would you feel if this happened to you? Let the customer know this. Once you’ve soothed your caller’s feelings, accepted responsibility for the call. This is different than accepting responsibility for the problem. More often than not, you are not the one who caused their issue, but you are the one who answered the phone, and by doing so, you’ve already accepted responsibility for the call. End the phone call on a happy note and then go find a way to relieve any pent up stress or frustrating feelings that you may have. Take a brisk walk, make a cup of tea, eat a piece of candy but don’t keep the stress cooped up inside you. If you do, you risk the chance of losing your cool on the next customer, or worse, a coworker or your boss. All communications with customers need to be handled with urgency. Research shows that 95% of dissatisfied customers will do business with a company again if their complaint is resolved on the spot. Failure to do this is a sure way to lose credibility with your customer. The majority of customers don’t like to complain; in fact, they’ll go out of their way to avoid it. Focus on the quality of the service you are providing rather than just moving the caller off of the line. Research shows that is costs 6 times more to attract a new customer as it does to keep an existing one. Make the customer’s job easy by doing your job well. There you have it! If there was any doubt in your mind how to properly handle the customer service of your business, you should be all set now. If you missed Part One, go back for a refresher. 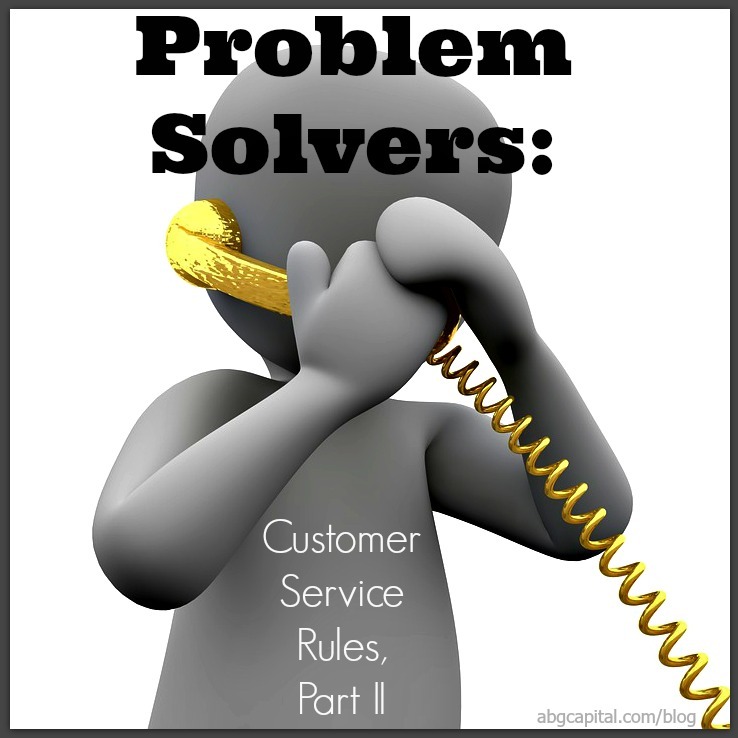 Have you had the opportunity to problem solve for a customer? What did you do? How did you solve it? Tell us in the comments below!